Home » Property-Windows » Windows – Repairs or Replacement – Which is Best? Windows – Repairs or Replacement – Which is Best? In our experience, the majority of wet-rot in window frames is in fact on and in the external sills and in the sashes (the window openers), whereas the main body of the frames are quite often solid and rot-free. 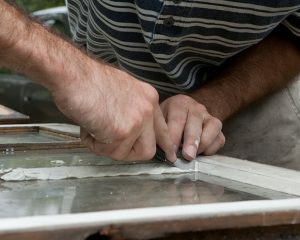 So when we evaluate (carry out a survey) a property for window repairs or replacement, we quite often recommend refurbishment because this can potentially save thousands of pounds, not just in the cost of the replacement windows, but also the cost of labour and the associated cost of building works when removing the old frames. There are now building regulations associated with house window repairs and when doing replacements because a property has rotten windows that can’t be repaired then there are strict building regulations that govern this. Splicing in a new sill is a job for a well-qualified joiner/ carpenter, who will be able to cut out all the old rotten wood and splice in a new section of timber, with the joint hardly being noticeable. Sash windows are normally made off site and then fitted at the same time as any splicing is undertaken – all that remains would then be for the new spliced timbers and the new sash or sashes to be primed, under-coated and glossed, and the job is complete. Unfortunately, sometimes when visiting a property for window repairs or replacement, it can inevitably result in condemning the existing frames, especially if the rot is bad and the windows are single-glazed. In those instances, it is likely that the whole property has rotten windows, and need replacement and in these cases the most popular choice seems to be replacing old wooden frames with new UPVC windows. We at AC Joinery can carry out many house window repairs and we can provide the total property window repairs and replacement service. We cover all areas around Altrincham, Trafford, Stockport and South Manchester.